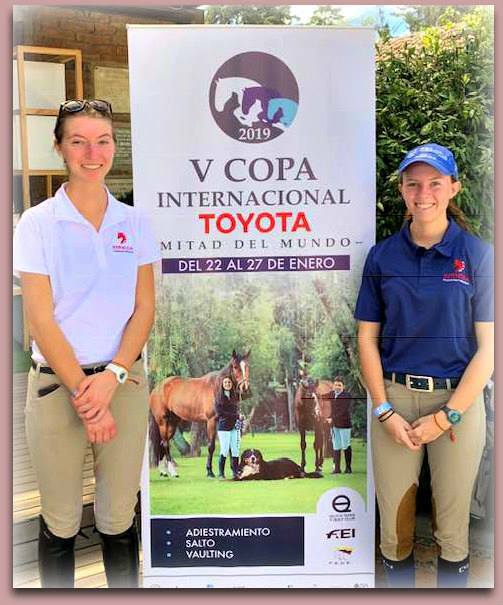 Accompanied by coach, Mary Frances Gaglio, Equestrian riders Courtney Bromby and Hannah Simmons competed in a show Jumping Competition hosted by the Ecuador Equestrian Federation. The Invitational competition was operated under FEI Rules on borrowed horses. Riders were required to successfully compete in two qualifying competitions before advancing on to the FINALS. In the qualifying competitions, Simmons achieved a Double Clear, which resulted in her qualifying for the “A” FINALS of the 1.05 - 1.10m Division. Simmons rode a superb Round in the FINALS, but incurred an unfortunate 4 Penalty Fault Points at the very last jump. Disappointedly, after the First Qualifying Round, Bromby was required to change to a substitute horse. With a beautifully executed Clear Round on the substituted horse, Bromby Qualified for the “B” FINAL in the 1.15 - 1.20m Division, but did not place in the FINALS. Other competing countries included Antiqua, Argentina, Bolivia, Canada, Chile, Costa Rica, Cuba, Ecuador, El Salvador, Jamaica, Guatemala, Surinam, Switzerland, Uruguay, Venezuela, and the USA.